With phenomenal market understanding, we are able to introduce an extensive range of Inert Gas Generator. 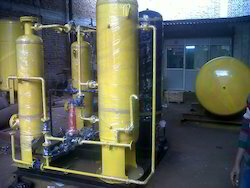 Gas Generators is a rapid inexpensive and effective apparatus to produce controllable amount of common gases such as hydrogen sulphide, carbon dioxide, etc. It is quickly charged and assembled and simple to operate. 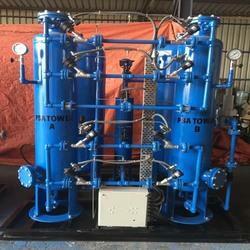 We have gained expertise in offering a quality range of Exo Gas Generator. "Prices Varies with Capaicty "
Complete Overhauling & Repair of Inert Gas Systems, Inert Gas Oxygen Analyzer& Inert Gas Generator Furnace Control. We offer a wide range of Exo Gas Generators that includes Raw Exo- Gas type, Partially Dry Exo- Gas type, and Perfectly Dry Exo- Gas type. These are used for the heat treatment of non-ferrous metals like for scale-free annealing of brass and bright annealing of copper, and ensure complete cracking of the products of combustion. Exo-Gas Generator produce protective atmosphere for heat treatment furnaces.lean Exo-gas or Rich Exo-gas is produced simply by changing air/fuel ratio. Lean EXO-gas generator are suitable for non-ferrous metals heat treatment .Rich Exo-gas generator are used for heat treatment of steel/brazing/annealing application. Inert Gas is produced by controlled combustion of LPG/Nitrogen or Kerosene fuels. It generally has very little Oxygen. It is mainly mixture of Carbon Dioxide (CO2) and Nitrogen and is commonly used in chemical, petro-chemical, refineries and cement industries for purging, inertization and to provide inert atmosphere. Periodic maintenance, inspection, testing, and repair of fire protection systems and appliances are very important so as to ensure that they are available for immediate use while the ship or offshore installation is in service.